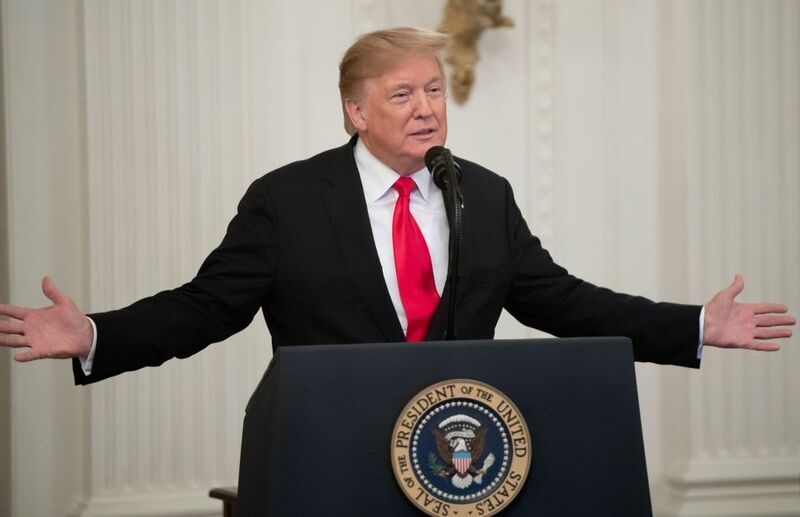 President Donald Trump has gone on the offensive against cable news networks CNN and MSNBC after Attorney General William Barr said the Mueller report found no evidence his presidential campaign had colluded with the Russia to influence the 2016 election. Speaking on Fox News’ The Sean Hannity Show, the president attacked the ratings of the two cable TV networks saying viewers had turned away from CNN and MSNBC’s because of their lack of credibility during coverage of the Mueller invstigation. Referring to both networks as “so horribly fake” and “fake news,” Trump claimed CNN and MSNBC had seen their ratings fall and welcomed the development. “The good news is I heard their ratings last night, both of them, were—they dropped off the folder,” the president said. “They dropped to a level that no one believes because now that they see the Mueller report, where you look at their finding… their finding was very, very strong—no collusion, no Russia, no nothing. It’s great,” he added. According to the Associated Press, Hannity has seen his ratings soar after Barr released a four page synopsis of the report by Special Counsel Mueller Sunday. The summary showed Mueller’s investigation found no evidence Donald Trump’s campaign “conspired or coordinated” with the Russian government to influence the 2016 presidential election. The president and his base, which favors Fox news, have been ebullient since the report was published and ratings figures have reflected that. On Monday, Hannity’s audience increased 4 million viewers, a 32 percent increase from his average. Fox anchors Tucker Carlson and Laura Ingraham also saw above average audiences while primetime hosts for CNN and MSNBC saw their audiences plunge. MSNBC’s flagship The Rachel Maddow Show saw its numbers dive Monday. Her audience of 2.5 million was 19 percent lower than average, dropping to 2.3 million Tuesday. However, analysis from the Associated Press explains audiences rise and fall when news reflects well on their own political camp. According to CNN’s own figures, during Michael Cohen’s damning testimony to the House Oversight Committee this month, more people watched on CNN in key demographics than on any other station. Last month CNN reported its third-highest February in 10 Years, with Cuomo Prime Time growing its audience more than 28 percent, illustrating that while the network may have taken a knock following the publishing of the Mueller report, ratings will continue to fluctuate as neworks ride the continuing waves of political turbulence.